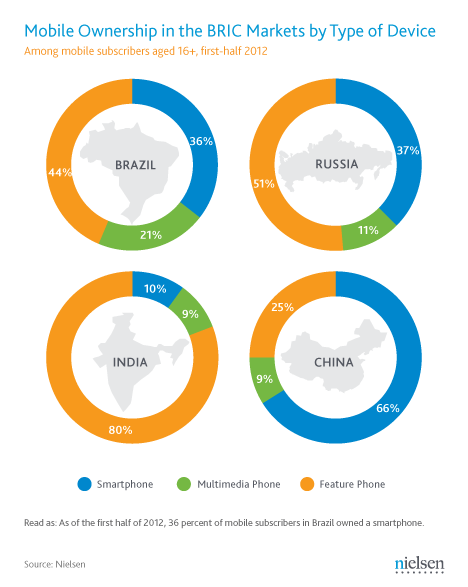 In a research note released today, Nielsen examines the potential for smartphone growth in the BRIC region (Brazil, Russia, India, China), where, in many cases, feature phones still dominate. According to the firm’s findings, only in China are smartphones predominant, where they’re now owned by two-thirds of mobile subscribers, as of the first half of 2012. However, in India, Russia and Brazil, users are only beginning to transition away from feature phones to newer, app-capable devices. In India, feature phones account for 80 percent of the mobile market, Nielsen says, followed by Russa at 51 percent, and Brazil at 44 percent. In Brazil, there’s more of an even split between feature phones, smartphones (36 percent) and a third category Nielsen dubs “multimedia” phones (21 percent). These multimedia phones have a touchscreen and/or a QWERTY keypad, but no smartphone operating system installed. They’re basically a better feature phone, if you had to classify them one way or the other. The data provided by Nielsen was a bit old (first half 2012), and perhaps also somewhat obvious to those who are tracking the industry closely. For example, in December 2011, mobile measurement firm Flurry listed India, China, Russia, India (and others) as some of the largest addressable markets for 2012. And around a year later, it also listed Russia and China among the fastest-growing iOS and Android markets by active devices, and noted that China in particular, was on track to top the U.S. iOS/Android install base by Q1 of 2013.